Yesterday hundreds of Dutch students entered and occupied the Maagdenhuis in the heart of Amsterdam to protest against the way the “College van Bestuur”, in short “CvB” communicates and executes its policies. The “CvB” is a kind of board of directors within the University of Amsterdam. This event is one of a series that highlights the discontent of many UvA students, teachers and faculties. Today the 26th of February the students are still present at the Maagdenhuis. Some time ago I learnt about how the University of Amsterdam(, in short UvA) tends to respond to disagreeing students. The occupation and squatting of the Spinhuis was met with procedures and attempted litigation. After the Spinhuis the occupation of the Bungehuis located at the Spuistraat followed. When I entered the Maagdenhuis last night I knew things were serious. 13-02-2015: in response to the starting occupation the UvA suggests to target a different building. 15-02-2015: the “CvB” reports unlawful entry of the Bungehuis to the police. 17-02-2015: the “CvB” starts a procedure to force the occupying students out. 17 to 19-02-2015: the “CvB” wants to demand 100.000 Euros from the occupying students. 19-02-2015: the “CvB” is in court awarded damages of 1000 to 2000 Euros per day. 24-02-2015: the “CvB” releases a full statement about its position regarding the occupying students. 25-02-2015: the police evicts the Bungehuis of its occupying students as a result of the procedure. 25-02-2015: in response to occupying the Maagdenhuis the “CvB” makes a short presence and statement. Between the 13th and the 26th of February the “CvB” led and chaired by Louise Gunning did little to reach out to and to actually communicate with the students. In fact where the students wanted a dialogue the “CvB” avoided the dialogue and avoided making any concessions. In following the developments the UvA entering the dialogue was sorely missed in my opinion. The core issue at the UvA is a simple yet complex one. The people in charge of the organisation have certain plans and goals in mind. The people who study and some teachers there are expected to adapt. Without satisfying explanation regarding why and how some students and teachers demand answers especially when faced with direct changes to their faculties. Changes are being made but the aspects of why, how and the consequences are poorly communicated. Hence “De Nieuwe Universiteit” demands a voice in the decision-making process and transparency from the people in charge. I understand that because I have experienced the changing of plans too and an explanation is always helpful. When your superiors fail to explain their plans it is difficult to take them seriously. Between the University and the students there is a third important party, the city of Amsterdam itself. Amsterdam is home to the UvA, VU and HvA among others. These three educational institutions are a big attraction for Dutch and international students who want academic degrees for a better future. The city of Amsterdam benefits when the UvA, VU and HvA are doing well and the students are generally satisfied with their chosen academic paths. Mayor Eberhard van der Laan must have understood this and thus intervened by inviting both parties for a dialogue. My perspective regarding this topic is simple. I am a student, have friends in the student movement and I am biased. Even when I take into consideration what the interests of the UvA and the students are, I pick the side of the students. I have experienced how managers and superiors mismanaged situations. As the subordinate or follower you either have to clean up the mess or you confront the one(s) responsible at the cost of losing your position. The way the “CvB” initially acted is in my opinion a case of bad PR and contempt for the students that indicates a lack of human and cultural understanding. Students are the reason the university exists in the first place. From Atheneum Illustre to now, the UvA should realise its reason for existence every time a new decision is made. 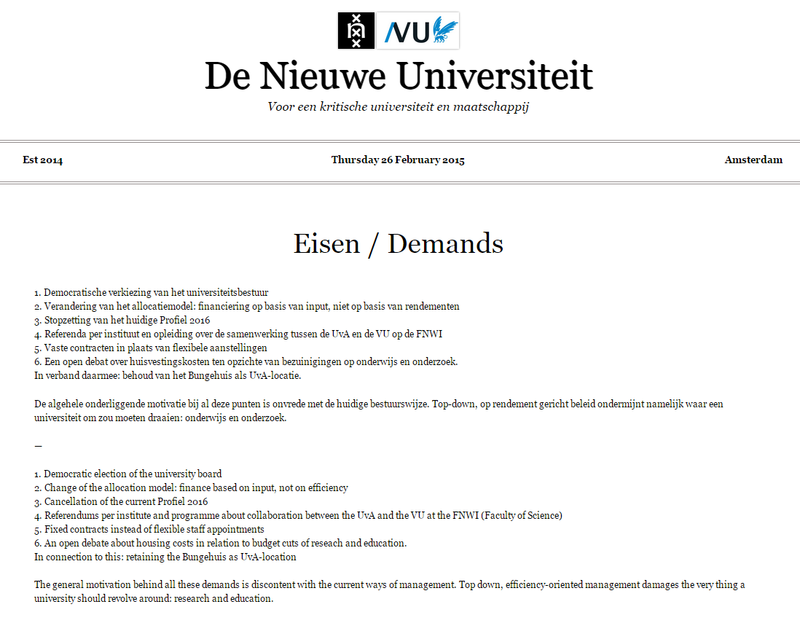 For more information about this topic check out the website of “De Nieuwe Universiteit.” There are more details about this situation within the UvA. My apologies if some details are missing. Disclaimer: the image can be found on this link.